Richmond is on a Roll! 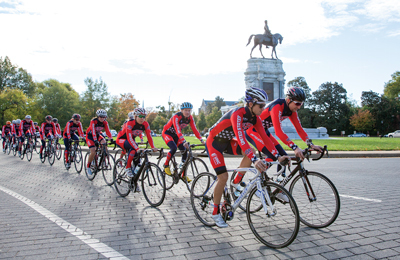 Elite-level Team USA cyclists took part in a training camp in Richmond to familiarize themselves with the courses they’ll ride for the 2015 UCI Road World Championships. The Cannon Creek Greenway, which parallels Richmond-Henrico Turnpike, offers 1.75 miles of paved shared-use path. “And we are working on two other shared/greenways,” Helmboldt says. But is that enough? According to a 2013 report by Sports Backers, “other U.S. cities comparable to the Richmond region far surpass the region in the miles of bicycle infrastructure currently on the ground, as well as what is planned for implementation in the coming years.” In 2013, the Richmond region had 18.25 miles of bike lanes and 145.7 miles of dirt trails scattered through various city parks. Those numbers come up short when you compare them to Portland, Oregon, which, according to the survey, had 318 miles of bicycle infrastructure (both on- and off-street biking) or Minneapolis, which is often rated as the country’s best bike city. Hepp-Buchanan estimates that about 60 percent of the people living in the region are interested in biking, but are concerned about their safety and their family’s safety on roads in the area. “Right now they don’t feel as comfortable,” he says. 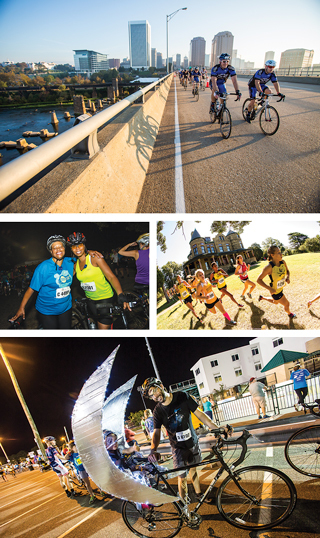 Sports Backers currently runs three events that help benefit Bike Walk RVA’s efforts. They are the family-oriented Anthem Moonlight Ride in August where riders dress up in costumes, decorate their bikes, and head out after dark on a secured course; the Maymont X-Country Festival, a trail running event; and The Martin’s Tour of Richmond. “The Martin’s Tour is held in October and it’s our big ride,” Hepp-Buchanan says. Riders can choose from the full 101-mile distance or three shorter courses. When it comes to the international cycling scene, Lang believes Richmond is getting more credibility thanks to the city’s hosting of the 2015 UCI Road World Championships this September. The New Kent dad has already carved out a week of vacation to watch and also volunteer for some of the events associated with the race. This will be the first time the event has been held on American soil since 1986. Recent host cities include Florence, Copenhagen, and Melbourne. 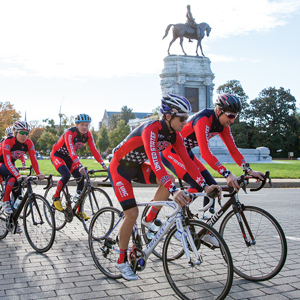 Richmond 2015, the organization overseeing the race, expects 450,000 onsite spectators over nine days of racing as well as a thousand of the world’s best cyclists from seventy-five countries. There will be twelve championship races in three disciplines: the traditional road race, individual time trial, and team time trial. Popular events from Sports Backers for families that support Bike Walk RVA’s mission of public-use trails for biking and running in Richmond include The Martin’s Tour of Richmond, the Maymont X-Country Festival, and the summer favorite, Anthem Moonlight Ride. The organization is partnering with Sports Backers on Conquer the Cobbles, a pair of evening public-participation events taking place in conjunction with this year’s World Championships. The events include a running race and bike ride that will give participants a chance to experience the same road circuit course that will be contested by world competitors. The riding event will be limited to 2,015 entrants. Amey, who has lived in Richmond since 1990, bikes to work each day and his family bikes to school. “I feel totally comfortable riding in traffic year round,” he says, adding that Richmond has only a small segment of year-round riders. When it comes to the biking culture in the city, Amey agrees that Richmond can do better. “There are so many progressive cities,” he says. He knows that many riders don’t feel comfortable riding in traffic. “There are ways to zigzag behind areas but they are not connected well,” he adds. Bar Mitzvah and Biking – a Perfect Fit! 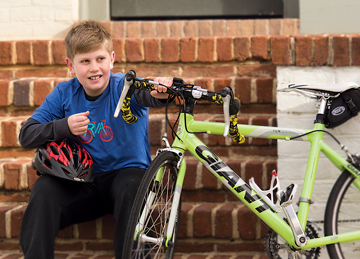 Mitchell Marcus, 13, rode his bike 500-plus miles last year to raise money for Bike Walk RVA, a group that advocates for safe biking in Richmond for all ages and abilities. This past January 24 was a big day for 13-year-old Mitchell Marcus. He celebrated both his bar mitzvah and exceeding his goal of riding his bike 500 miles to raise money for Sports Backers’ Bike Walk RVA. His final count on that day: 514 miles. His monetary goal of raising $5,000, however, is still ongoing – $4,000 and counting. The Moody Middle School student came up with the idea of raising money for Bike Walk RVA to satisfy a community service project for his bar mitzvah. He settled on biking specifically after going with his older brother to look at colleges in Syracuse and Boston. Mitchell’s dad, Rick, also bikes both solo and with the family, but admits he is concerned about safety on the roadways. “When we would go out for our rides there was lots of traffic we had to worry about,” he says. Hepp-Buchanan was surprised at Mitchell’s offer. “That was the first time I had someone contact us directly about wanting to help raise money for bicycle advocacy,” he says. “We wanted to work with him as much as we could. Mitchell originally thought about riding a hundred miles and raising $1,000 but “my dad said I could do better,” he says, noting the five-fold increase they finally agreed upon. To start the process, Sports Backers created a donation page and Rick began distributing flyers at his job. “We also put it on Facebook,” he says. When the invitations to the Bar Mitzvah went out, a note was added explaining what Mitchell was doing and telling people their donations would be appreciated. Money for the project is being raised through the Sports Backers’ website. “We have already received $4,000, thanks to Mitchell,” Hepp-Buchanan says. The organization is putting that money toward different initiatives such as Bike Walk RVA Academy, which helps develop biking and walking advocates, and Connect RVA, helping to make the region a better place to bike and walk. Mitchell clocked in the first miles toward his goal on February 22, 2014. He and his dad rode twelve miles that day, mostly in the Short Pump area, which isn’t exactly known for its bike-friendly roads. “We have loops we have mapped out,” Rick says. Most of Mitchell’s miles, 450 to be exact, were recorded outside. When the weather turned cold, he retreated inside to ride on a stationary bike.